E3 is practically upon us gamers! So this week's Noob Talk is part one of a two part episode. Liban and Saf are back to give our thoughts on what could go down at E3 as we look at the first 3 conferences; Bethesda, Microsoft and EA. Will we see a release date for Holo lens? Will Bethesda wow us again? Will we see EA revive the Fight Night franchise? Part two of our E3 2016 predictions will be up next Monday! So please do like and comment on the video; and subscribe to the channel for more awesome updates! 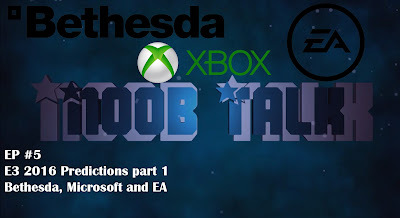 Noob Talk is available every Monday!